SNITZEL (AUS) (Bay 2002-Stud 2006). 7 wins-4 at 2, MRC Oakleigh P., Gr.1. Champion Aust. Sire twice. Sire of 965 rnrs, 719 wnrs, 89 SW, inc. Trapeze Artist (ATC TJ Smith S., Gr.1), Shamus Award, Estijaab, Redzel, Summer Passage, Invader, Russian Revolution, Hot Snitzel, Sweet Idea, Sizzling, Snitzerland, Wandjina, Heavenly Blue, I Am Excited, Spill the Beans, Menari, Showtime, Snitty Kitty, Thronum, French Emotion, Time for War, etc. Ranryoo (c. by Redoute's Choice). 5 wins from 1400m to 1800m, 143,126,000¥, Tokyo Shonan S., Freeway S., Kyoto Kizugawa Tokubetsu, Murasakino Tokubetsu, 2d Tokyo November S., Kyoto Yasaka S., Nishiki S., Asuka S., Hanshin Motomachi S., Nishinomiya S., Niigata Nippo Sho, Hanshin Horaikyo Tokubetsu, 3d Hanshin Suma Tokubetsu, 4th Hanshin Marguerite S., L.
Sizzling Bullet (g. by Snitzel). 3 wins. See below. 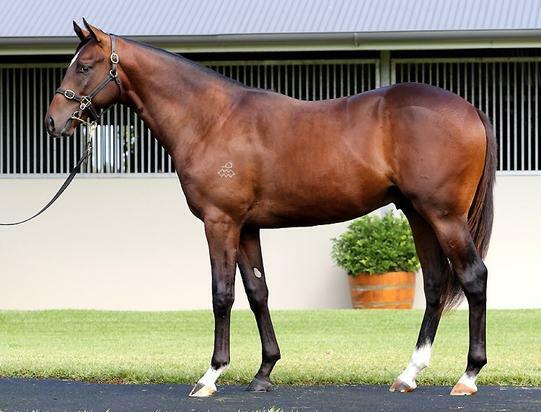 Great Choice (c. by Redoute's Choice). 5 wins to 1350m, A$75,490, 2d ATC TAB Quaddie H.
Hollow Crown (c. by Hussonet). 2 wins at 1600m, 1800m in Japan. HOLLOW BULLET (Tayasu Tsuyoshi). 6 wins. See above. Red Hot Choice (Redoute's Choice). Winner at 1200m, 2d WATC Aquanita S., L, St Leger, L, Owner for a Day 2YO P. Sire. Esprit de Bullet (Bel Esprit). 12 wins to 1100m, A$380,028, VRC Red Tempo H., MVRC City Jeep Compass H., SAJC Schweppes H., McGrath Foundation H., MVRC Essendon Mazda 55 Second Challenge Heat H., SAJC Sloans Sands H., Adelaide Galvanising H., CFMEU H., Evright.com H., 2d SAJC Manihi Classic, L, 3d SAJC Manihi Classic, L, Irish Day August 21st H.
Almighty Bullet. 8 wins from 1100m to 1600m, A$214,260, SAJC Holdfast Insurance Brokers H., Taylor Collision H., Sportingbet H., Centrebet H., Independent Produce Supplies H., Christmas Twilight Races H., Family Fun Day H., 2d SAJC Adelaide Galvanising H., Channel 7 H., Sportingbet H., Life Members Lunch P., 3d SAJC Oxford Insurance Brokers H., Burns Ceilings & Building H., Quayclean H.
Bulleton. 2 wins at 1400m, SAJC Allan Scott Park Morphettville H., 3d SAJC SA Unions H. Sire. Imperial Faberges. 2 wins at 1200m, 1250m, SAJC Adelaide Produce Markets H., 2d MRC Nicopolis H., 3d MRC Vitalic H., SAJC Lienert Australila H., Jansz H.
VIENNA MISS (Snitzel). 2 wins at 1550m, 1600m, A$162,180, SAJC Adelaide Guineas, L, Peter Elberg Funerals 3YO H., 2d SAJC Quayclean H., 4th SAJC Morphettville Guineas, L.
Little Bit Ditsy (Bel Esprit). 3 wins-1 at 2-from 1000m to 1600m, A$135,050, BRC Diona Civil Engineers H., Canadian Club H., Sirromet Wines 2YO H., 3d BRC Princess S., L.
LET IT SLIP (Not a Single Doubt). 4 wins at 1000m, 1200m, A$311,225, Pinjarra RC Magic Millions WA 3YO Trophy, RL, WATC Placid Ark S., L, Amelia Park Beef H., 2d WATC Sheila Gwynne Classic, L.
GANGBUSTER (Blackfriars). 3 wins-1 at 2-at 1300m, 1600m, A$181,570, to 2018-19, WATC Lex Piper S., L, Melbourne Cup Tour Dinner 2YO P., 3d WATC Challenge S., L, 4th WATC JC Roberts S., L.
Race Record: 23 Starts 3-2-2 A$164,350. 3 wins from 1600m to 2000m, A$164,350, ATC Theraces H., Greg Carmody H., Husson at Vinery P., 2d ATC Heritage Centre H., 3d SAJC Nutella Palooza 20/4 H.